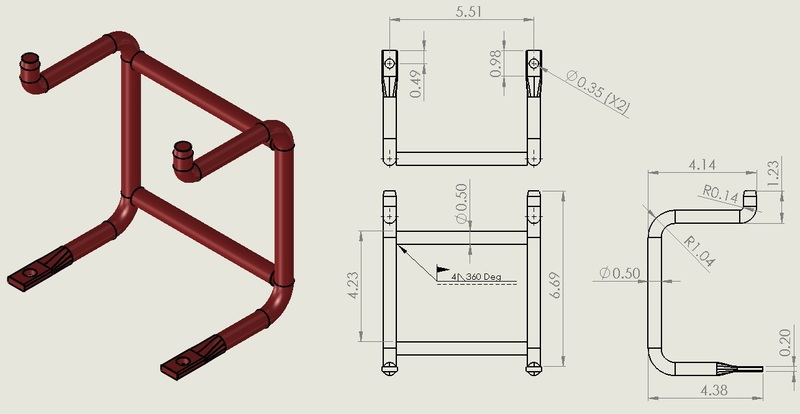 Are you thinking of using a wireform in your assembly? Would it help if you knew the typical design constraints related to wireforming? If your answers to these questions are “YES” then this section of our site is here for you! We cannot be design responsible for a customer’s part, but we have set this list up to let our customers and potential customers know what our wire and tube bending capabilities and limitations are as well as make them aware of what drives cost in a design. If your application allows you to stay within these parameters then you can be assured that your cost will be lower than if your design requires you to fall outside of these loose guidelines. These are meant to be suggestions to simplify your design and are in by no means the only way to do things. Clark Engineering Company does not assume responsibility for your design through use of these suggestions as it cannot verify it’s interaction with other components or it’s functional intent. Profile: Solid round steel is the most economical option for most designs. We currently produce parts with a solid square profile and a solid Hexagon profile per the customers design if needed. Chemistry: Clark Engineering Company has experience and currently produces parts from low to medium carbon steels, stainless, aluminum, brass, copper, pre-galvanized, and more. Finishing: Although we do not plate or provide finish on our parts in house we have our own trucks and make milk runs to outside processing with finishes like Clear and yellow Zinc, Epoxy and Acrylic E-coat, powder coat, phos and oil, black zinc, etc. These are the types of finishes we use on a daily basis. Contact sales or engineering for a finish that is not listed.